The government has given the go-ahead to a set of learning standards, developed by ground-breaking nurses in England for new healthcare apprentices. A single ‘trailblazer’ group has spent two years developing standards and assessments to replace old frameworks, which nurses say were sometimes irrelevant and failed to meet employers’ needs. The three types of apprenticeship, which take from 12 months to two years, form part of a drive to develop new career pathways into nursing and provide progression for the healthcare assistant (HCA) workforce. The trailblazer group represented employers across healthcare and included nurses from general practice, acute care, mental health and hospices. There is also the opportunity to learn certain disciplines – senior healthcare support workers can take placement options in adult nursing, mental health, maternity or theatre support. There will also be future options for further development in the care of children and young people, working as an allied health professional and end of life care. Ms Fawcett says: ‘The best part has been working with the energy and enthusiasm of the employers, who have got around the table and who are keen to see this apply to their sector. The government wants to see three million young people in apprenticeships by 2020 and new standards are now being developed by all sectors in England. The emphasis on employer input came from the 2012 Richard Review of Apprenticeships, which recommended that recognised industry standards should form the heart of every apprenticeship. Royal Devon and Exeter NHS Foundation Trust lead tutor for vocational education, Claudia Trick was part of the trailblazer group providing input from the acute sector. Ms Trick calls the new standards ‘robust’ and says they will allow staff already in nursing auxiliary, HCA or assistant practitioner roles in acute trusts to develop on more defined career pathways. NHS employers with wage bills of more than £3 million will pay a levy of 0.5%, which will be used to fund apprenticeships for their organisation. Ms Trick adds that involvement in the trailblazer helped ensure that apprenticeship standards are relevant and appropriate to her staff. Loo Blackburn, who has 30 years of experience as a practice nurse, sat on the trailblazer group to ensure the requirements of primary care were captured in the plans. ‘We are future-proofing opportunities in general practice. A lot of the language [initially] related to NHS trusts,’ says Ms Blackburn, explaining that there was a first mention of bathing patients in the standards, something not done in general practice. Thanks to input from many areas of care, apprenticeship standards are tailored far more accurately to the roles people perform in an organisation than the old frameworks allowed. 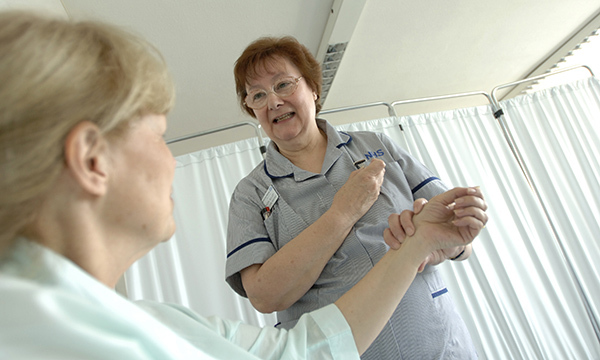 Healthcare support workers will carry out ‘well defined routine clinical duties’, such as checking blood pressure, temperature and weight, while those who are more senior will assist registered healthcare practitioners with clinical tasks, follow care plans and recognise deterioration in health. Ms Blackburn emphasises that healthcare apprenticeships will not replace registered nurses. ‘Apprenticeships will provide opportunities for people who didn’t meet academic requirements to become a nurse,’ she adds, cautioning ‘early days’. Nearly two years ago, Health Education England’s Shape of Caring review set out 34 recommendations to shake up nursing education, including the development of ‘more innovative work-based learning routes’. St Christopher’s Hospices vocational programmes manager Sally Garbett, who was part of the trailblazer group, welcomes new apprenticeship routes into nursing. Ms Garbett adds that the new nursing associate role and plans for a nursing degree apprenticeship this September will enable people to ‘earn while they learn’ and avoid student loan debt. ‘These apprenticeships enable people to start their career in nursing as healthcare support worker apprentices; this is a brilliant, flexible route. ‘Many hospices use apprenticeships as part of workforce development and many more will benefit from these new standards,’ she adds. Health Education North West London is coordinating the delivery of the newly developed healthcare support worker apprenticeships for a group of 60 students this autumn. Loo Blackburn, who was a practice nurse for three decades, is working with a college to develop the programme with 20 placements in general practice, 20 in care homes and 20 in domiciliary care. Ms Blackburn says it is hoped that, on completion of the 18-month programme, apprentices will have the skills to be able to apply for access to the nursing associate course.